Gamblers usually carry with them their own good luck charms. 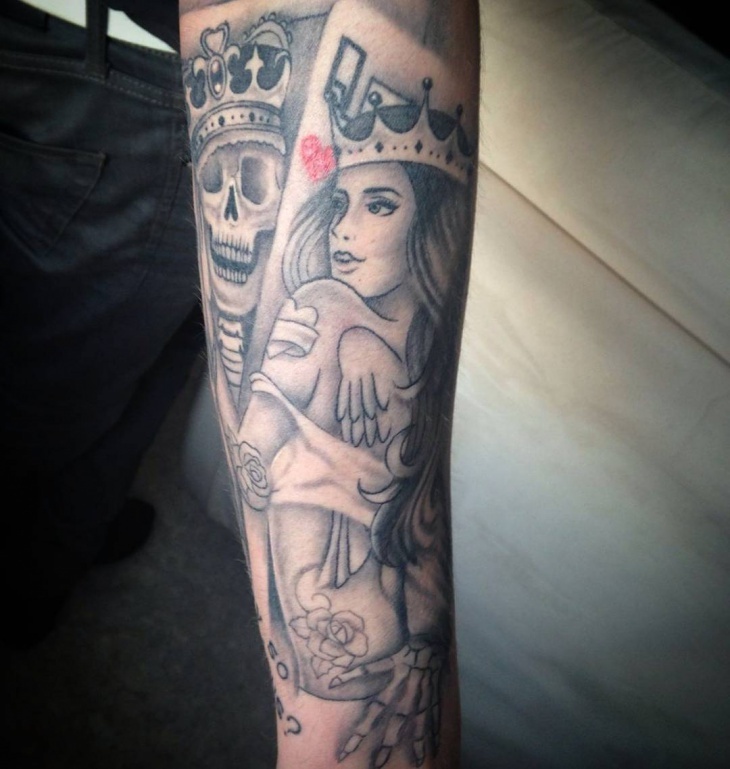 Some have theirs tattooed on their skins. 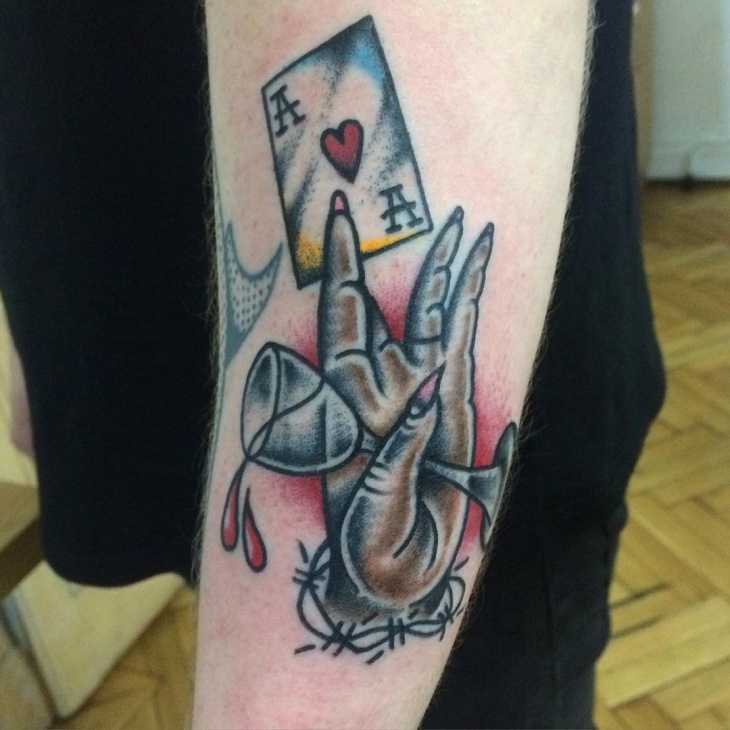 This is where gambling tattoos come in. As gambling is a big industry, many people are getting very much into it. 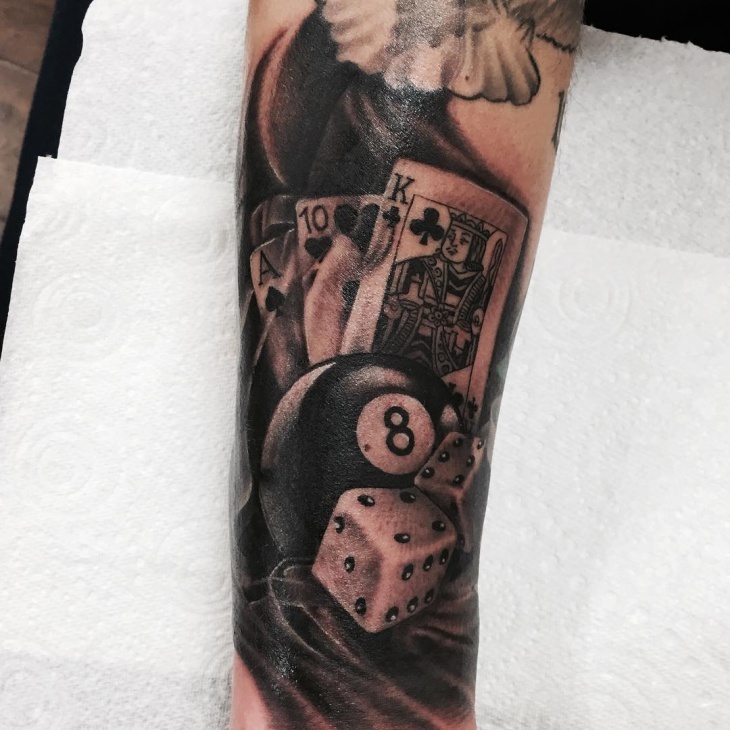 If you enjoy gambling and like the experience of the games, it would be a good idea to consider getting a gambling tattoo for luck. The first thing that you need to do is to establish or identify a symbol that would fit your kind of games. 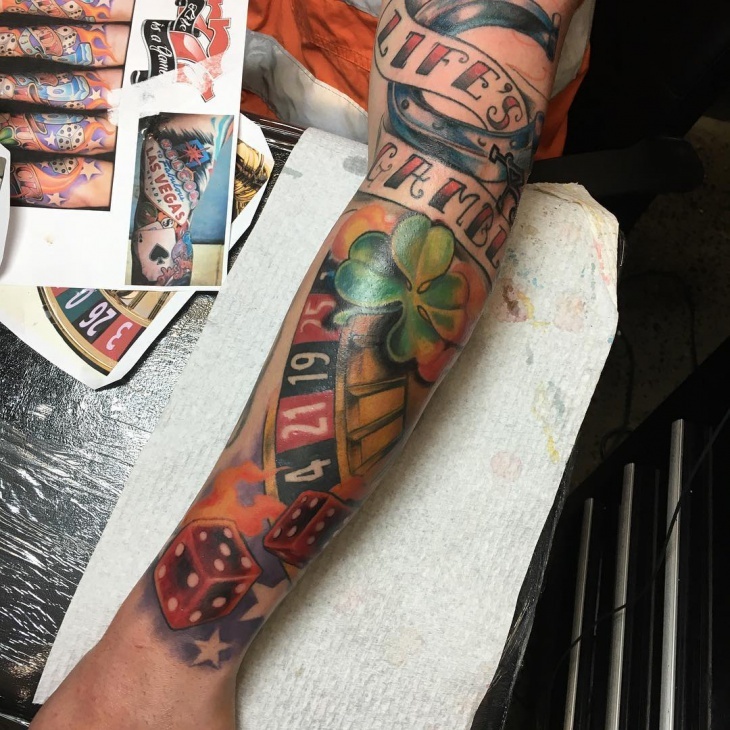 “Life’s a Gamble” that is so true and this sleeve tattoo designs says it all. It has features that are familiar with gambling and the casino. It is colorful and flashy and if you have the attitude to carry it off, then you should get this or one similar to it. 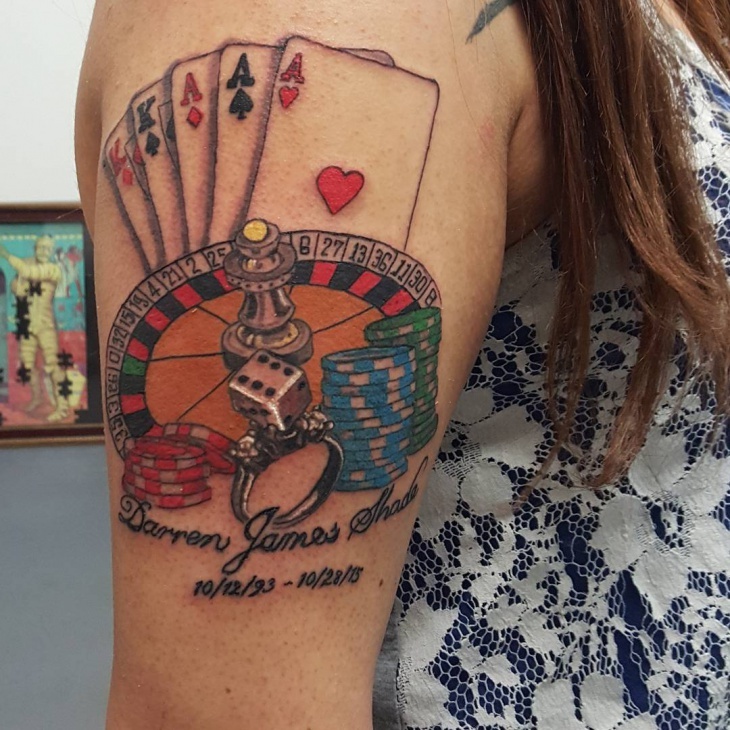 This memorial tattoo is designed to pay tribute to someone who likes gambling. 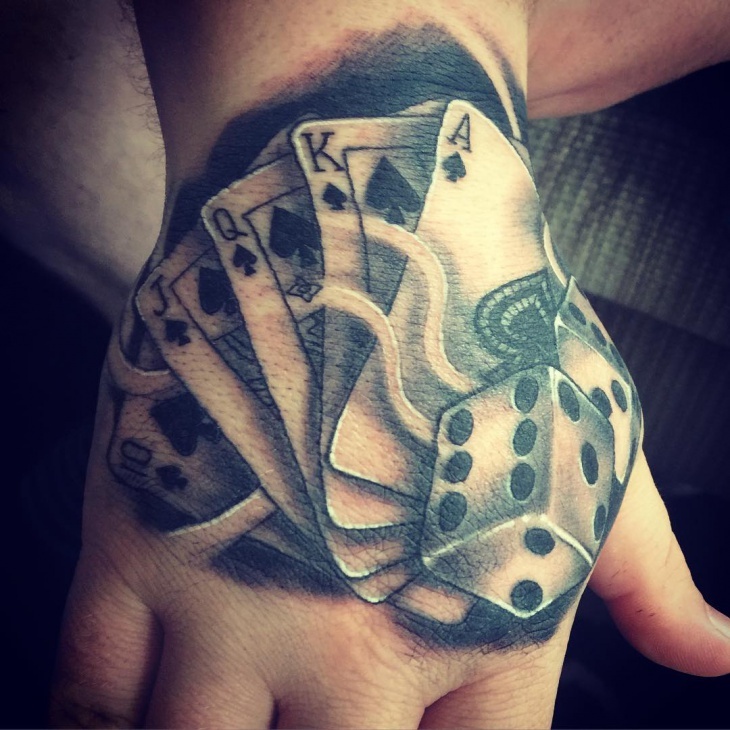 The roulette, cards, chips all relates to the casino and the ring with the dice feature indicates that the person wearing the tattoo was romantically involved with the man whose name is tattooed under the design. 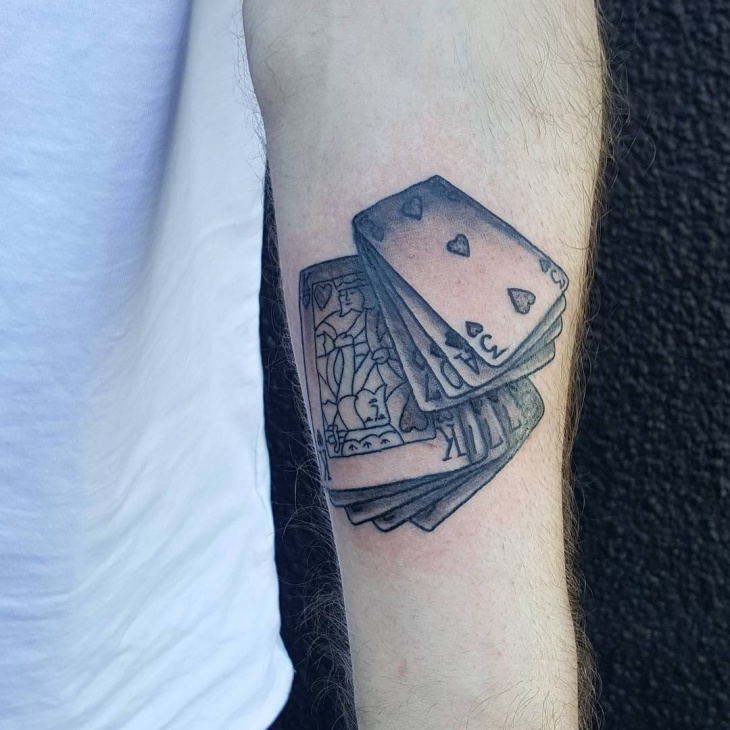 This black and grey casino tattoo is one badass design. 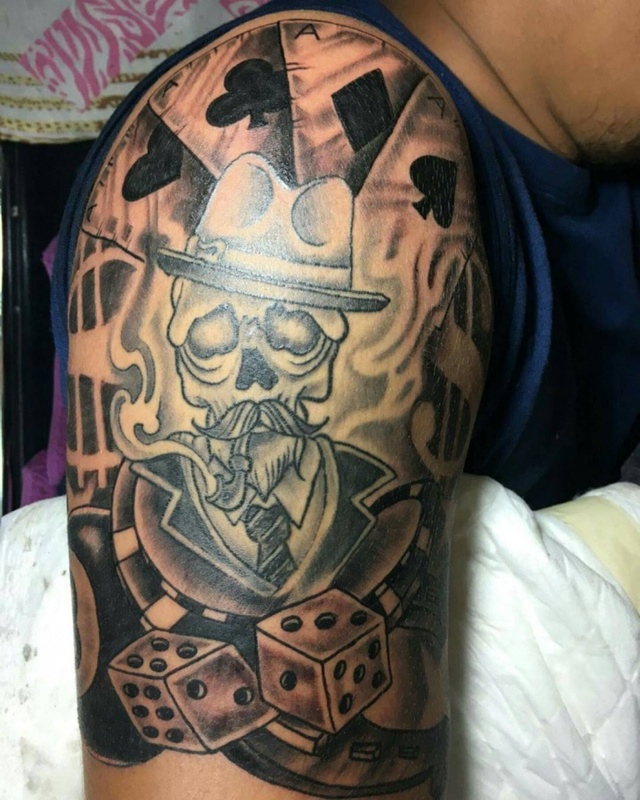 The skull feature alone should be enough to convince anyone that it is the tattoo for die-hard gamblers. 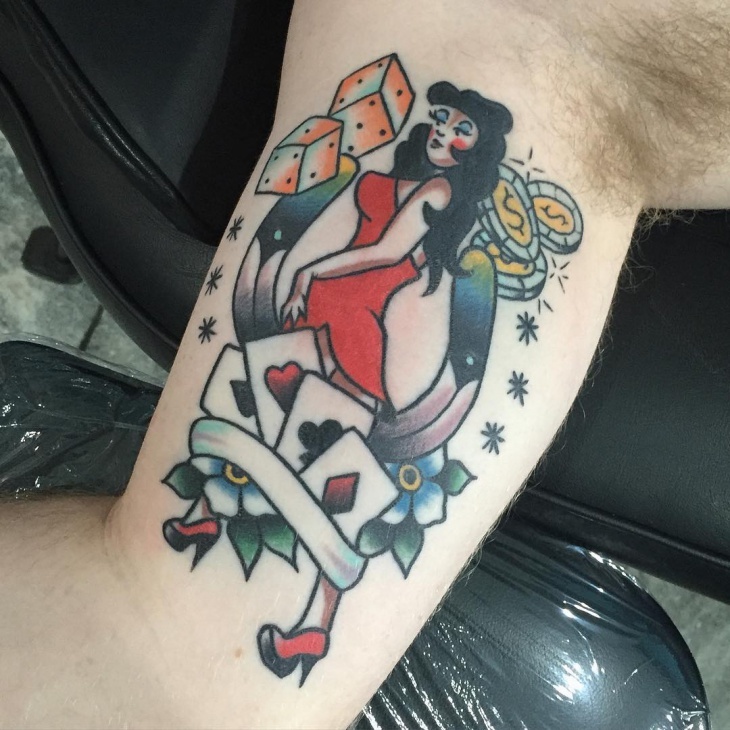 The tattoo is composed of a traditional casino scene – a man smoking on a pipe surrounded by cards, dice, and the dollar sign. Gambling and women do mix well. 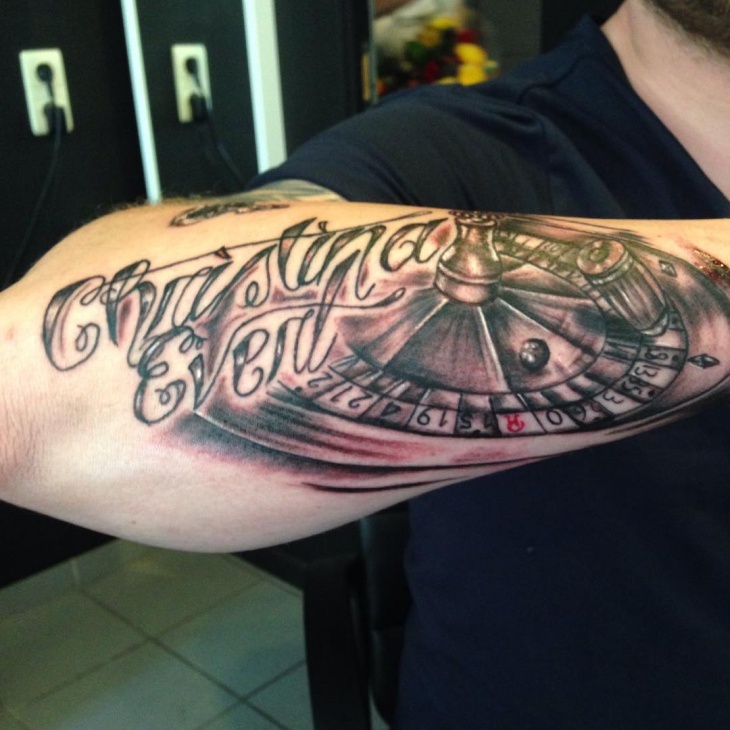 This tattoo is a representation of the two main subjects that make a man happy – a woman’s name and the roulette symbol. 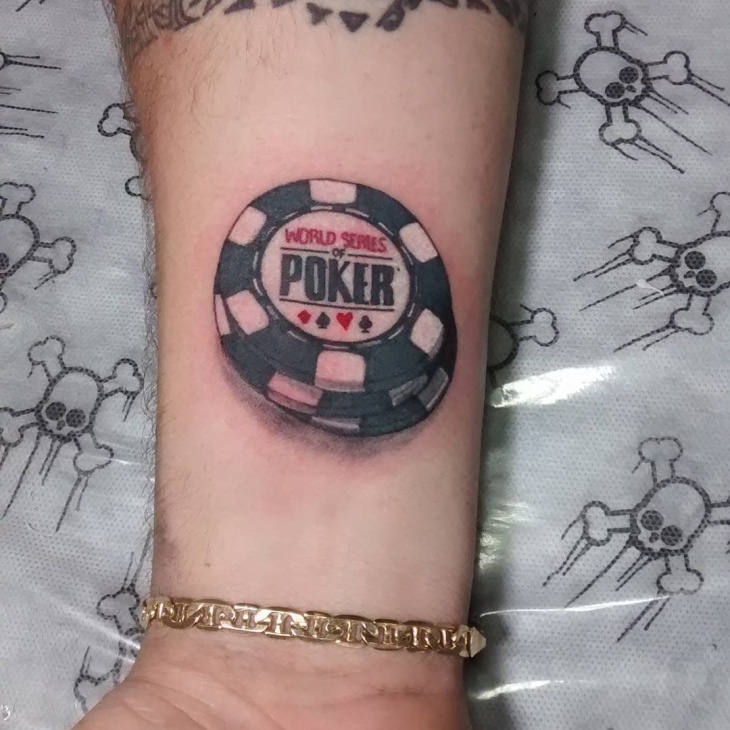 Obviously, the man wearing this tattoo does not believe that it is not possible to be happy in love and lucky in gambling. 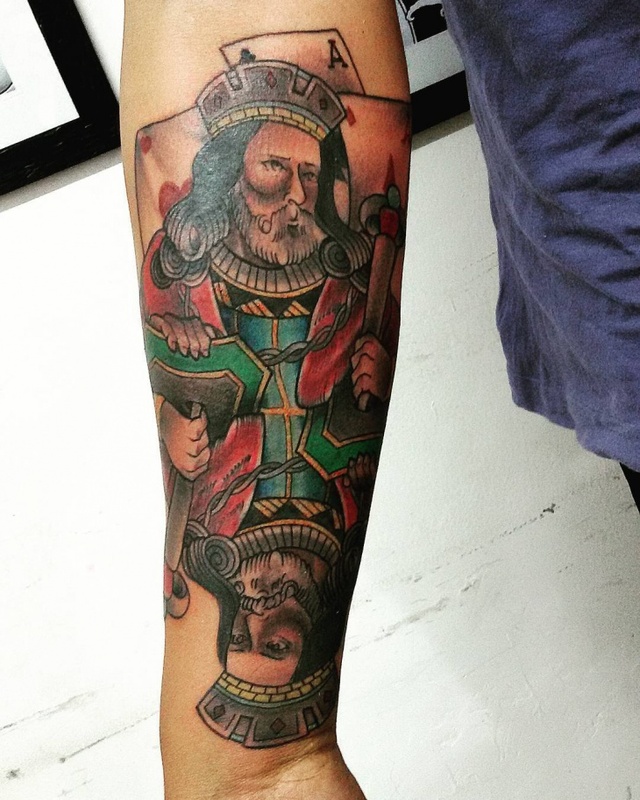 This colorful King rules this small kingdom inked on a man’s arm. This is an indication that card games – like poker – are still the best games in any gambling gathering. 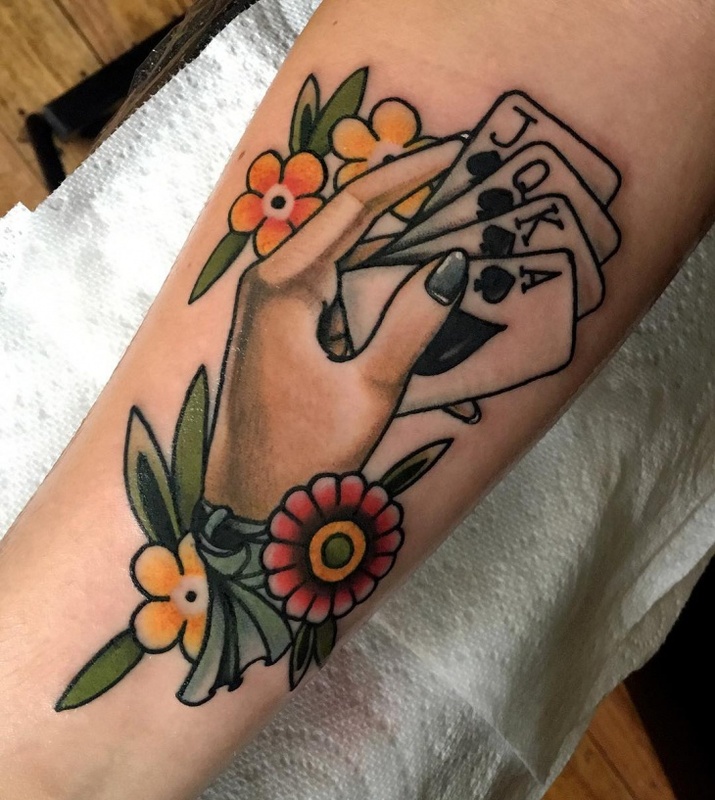 This is a small and simple poker hand tattoo design that should appeal to you if you are not very much into flashy designs. It is also a good option if you like the game of poker very much. 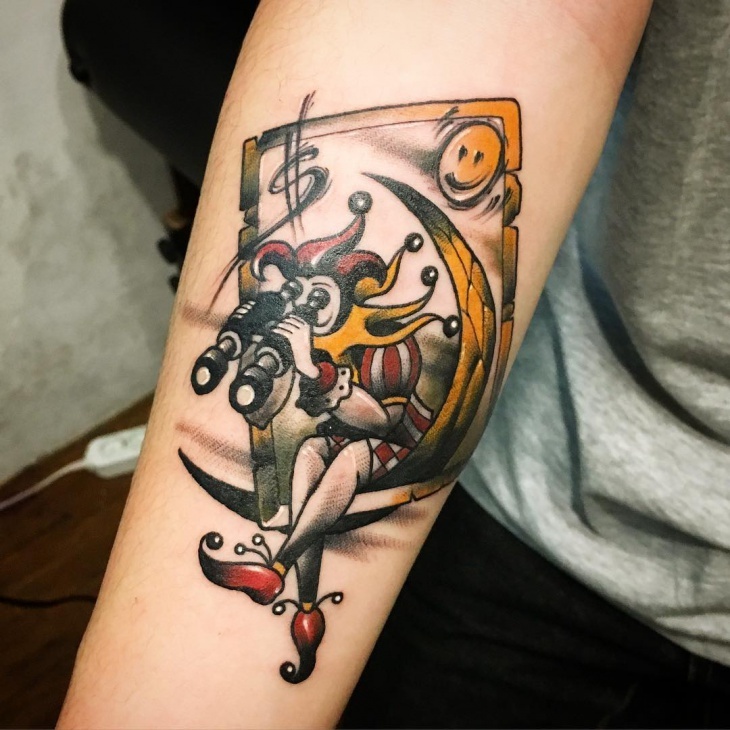 The Joker takes center stage in this tattoo design. It is represented in a funny and entertaining way like it is just sitting there watching the people gamble their money away. The design is unique and definitely interesting. 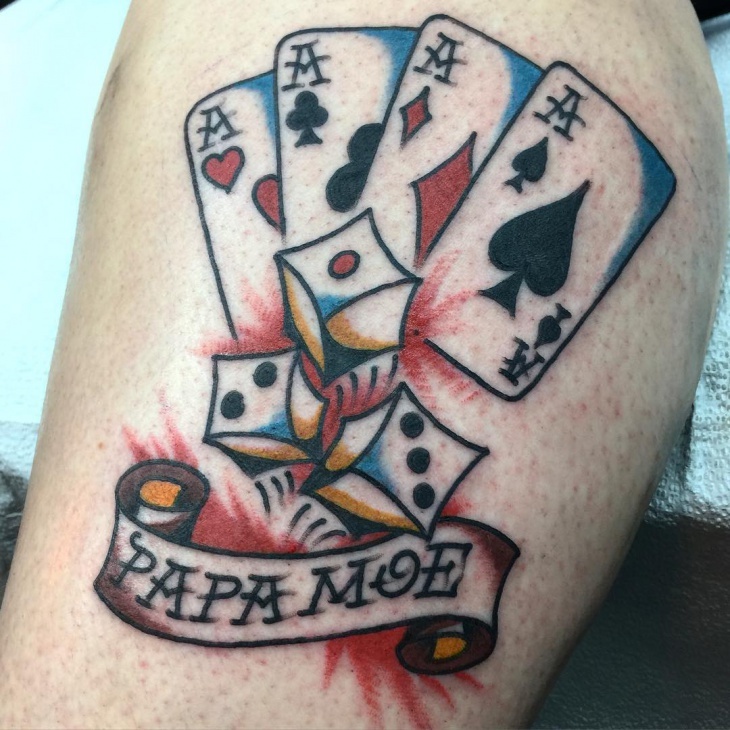 The four Aces are well represented in this gambling tattoo design. 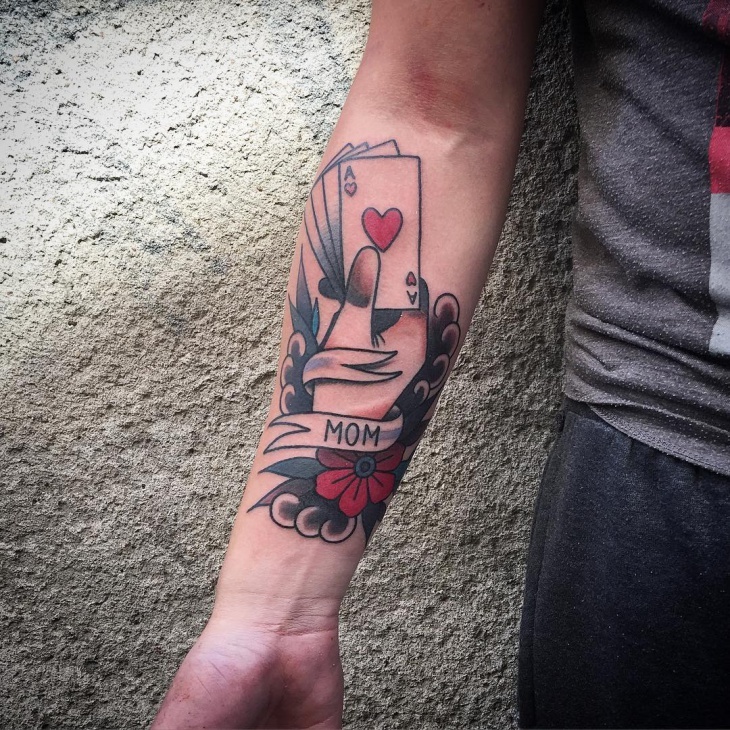 The cards along with three dices are joined by a simple banner that can be inked with someone’s name. Who would not want to have a Royal Flash in their hands? 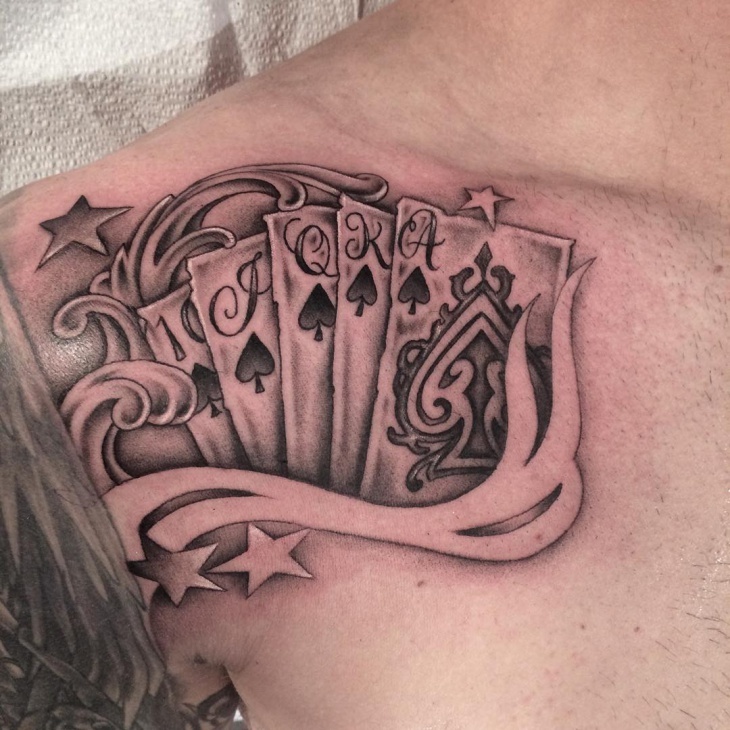 This shoulder gambling tattoo is nicely done in neutral color. It is not flashy and colorful, but the message is clear, winning is the only objective and losing is not an option. 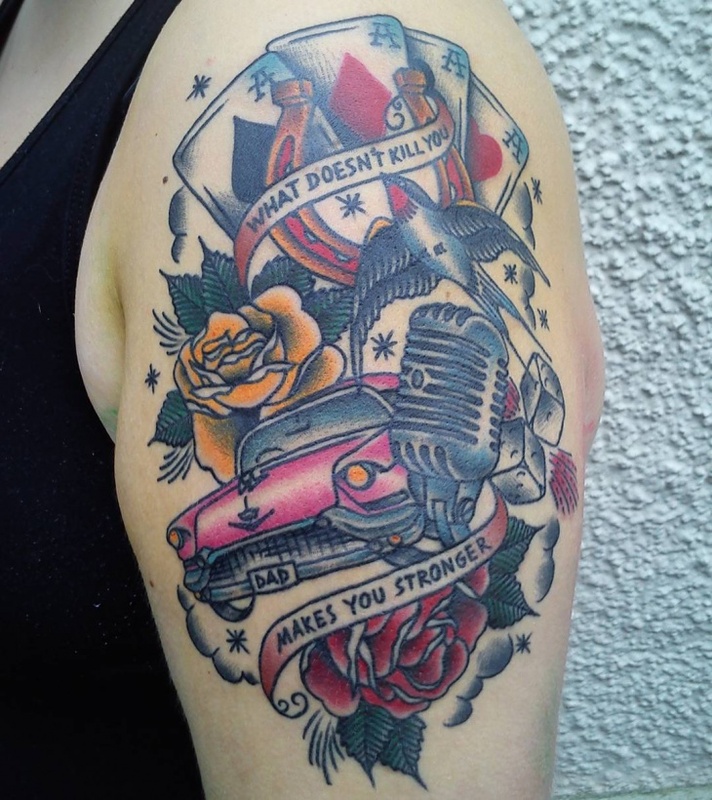 The images above should prove that there are several types of gambling tattoos. The features differ and the most commonly used are the cards, dice, and roulette. Other features that could be used include the slot machines. 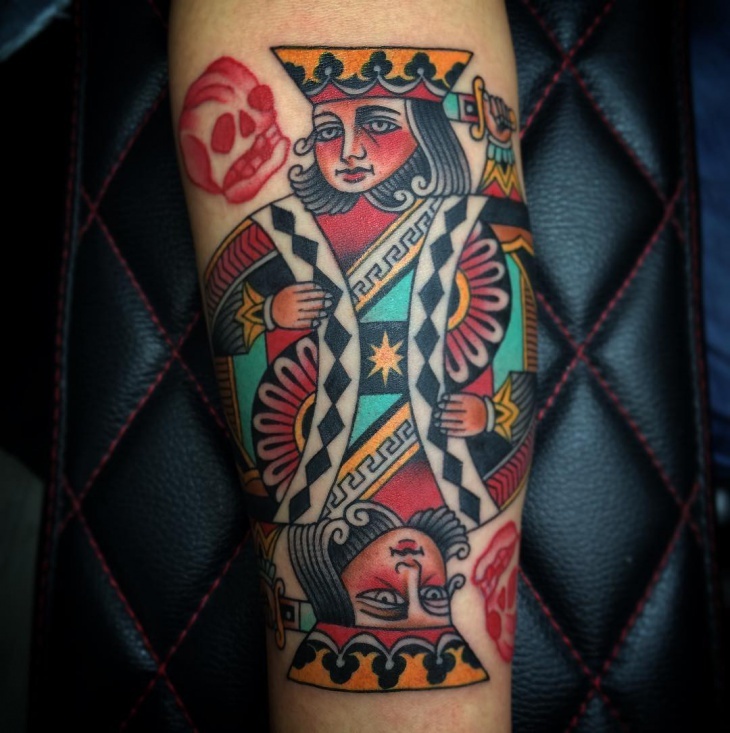 Gambling tattoos can also be simply done in Black and Grey or flashy with colorful motifs. Gambling is an enjoyable past time. That is, as long as you know how to control yourself or if you know how to prevent getting addicted. 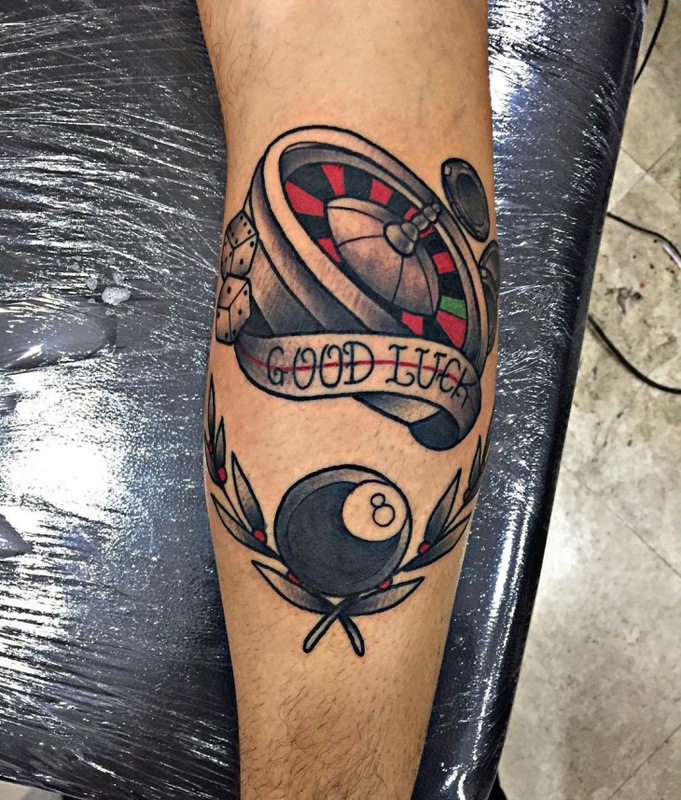 If you want to have some good luck before you start playing your favorite casino game, it would be a good idea to get a good luck charm that you would never lose – a gambling tattoo.